Today’s AE firms are partnering with clients and bringing multiple, sometimes unconventional, players to the table. As you may have heard, architecture isn’t just about designing spaces anymore. With budgets lower than ever, firms are turning to unconventional business models and using new business strategies to remain relevant and viable. They must now think beyond  from before the start of a project to well after it’s finished. This means they are brought in earlier, when no project exists, and asked to create something that will generate revenue and look and perform great. Never before has the A/E marketplace seen such a broad scale of expanded design services. They are competing in a world where some advertising firms are keeping architects and interior designers on their staff to craft a complete branded experience. 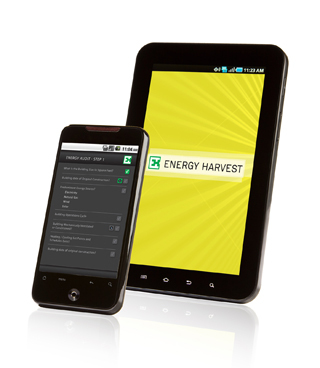 An app called Energy Harvest allows users to conduct energy audits of their buildings and transmit the findings to BCRA’s Building Science division for evaluation. Today’s forward-looking A/E firms are responding to the challenge, integrating marketing, research and graphics professionals into their staff. By adding these complementary services, A/E firms are able to provide a seamless design experience that translates beyond the traditional boundaries of brick and mortar. From websites and leasing brochures to brand identities and even menu designs, clients are turning to their A/E partner to provide one-stop design services that help holistically translate their unique messaging across the entire experience. Some firms are researching and developing products or developing new, innovative services to take to market to better position themselves in the challenging economy. For example, there are a handful of firms that are exploring modular construction in commercial buildings, such as using shipping containers as habitable structures. Another local architecture firm has teamed with a group of professionals, including a developer, to create an entirely new method for constructing multi-floor buildings by lifting the floors from below, much like a stack of pancakes that is raised into position. The common thread? Speed and ease of construction can be increased, while costs can be lowered  without sacrificing creativity. Leaps in energy efficiency are being made, encouraged by increasingly stringent energy codes and dwindling worldwide energy supplies. While the low-hanging fruit here includes smart meters and solar panels, some firms are thinking larger. 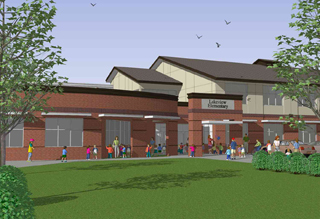 BCRA designed Lakeview Elementary for the Clover Park School District after helping the district with a bond issue. For example, BCRA has developed an application for smart phones and tablets, called Energy Harvest, which allows users worldwide to conduct energy audits of their existing buildings, and then transmit their findings directly to our Building Science division. The result is speed and ease of use for the client to assess their facilities’ performance, an increase of remediation work for the architects and a new revenue channel for BCRA’s Building Science division. A/E firms must create some of their own work. The next generation of innovation needs to dig deeper into the bones of existing buildings to maximize potential energy savings. This is a reduce-reuse-recycle culture, which is translating to the built environment. Architects must consider not just the client, but the community, the environment and user. We are the idea people, the fundamental problem solvers. This includes solving our own problems with ingenuity and determination. Architects are no strangers to managing a team of consultants, but in today’s climate of public-private partnerships and multiple sources of funding, new stakeholders have emerged that also demand a seat at the design table. It’s not enough to merely involve them; we must also understand the unique and important role that each of these newcomers plays, and be skilled at the art of getting them all to talk to each other, talk to us, and let the team know what they want for the project. On a private development, it is not at all strange for the architect to be in charge of facilitating discussions with the owner and their entire entourage including the owner’s representative, the real estate broker, the leasing agent (frequently different from the broker), the tenant, the tenant’s real estate broker and the commercial lender. This is great for us. The collaborative approach helps to ensure that all desires and wishes for the project are incorporated into the design. However, we have to perform a careful balancing act and skillfully be able to focus attention where it needs to be. In other words, in addition to solving design problems, we are now expected to act as the master of ceremonies. With today’s financial challenges and strict lending requirements, designers are often helping clients find creative sources for project funding. Some clients have a limited understanding of who needs to be brought to the table or their partner options. Or, to take it a step further  a client may not even realize they could have a viable project, unless they have the right help. Design professionals must look for these opportunities at the ground level, bring additional players to the table and help the project get funded before finally moving forward with design. Great designers? OK, sure. Opportunities to increase revenue for our clients? Bingo. We must go a step further and seek these opportunities, whether through feasibility or other marketing strategies, to help our clients make money. Helping a client with their marketing strategy goes beyond a brochure, flyer or cool graphic. In today’s climate, it involves a true partnership with the client and bringing multiple, sometimes unconventional, players to the table. For example, BCRA held a traditional architect-owner relationship with the Clover Park School District for a number of years. Over the last two years, this has evolved into one of collaboration and outreach to help the district envision its future plans for capital projects bonding. The school district used BCRA to develop relationships with local jurisdictions, community groups, the private sector and even federal agencies to envision a facilities plan that each could support. The outcome was a successful repeat capital projects ballot measure in 2010, followed by new funding opportunities through the federal government that are helping to replace outdated school facilities. Instead of a reactive approach, we are taking a proactive business approach. We need to watch what is happening in our communities, come up with a new approach, and find the funding opportunities. We must observe, listen and respond, and we must be leaner than ever. As architects, we can see opportunities to bring in other types of help that will positively impact the bottom line and success of the project. The most successful teams are considering all of these factors, which go way beyond the architect and owner. In this way, even the term “highest and best use” has a new life and a new future. With a master of architecture from University of Washington and a bachelor’s degree in marketing and management from University of Oregon, Todd Wolf is a combination practical business person meets creative designer and project manager. He is a member of the National Association of Industrial and Office Properties, International Council of Shopping Centers, and Washington Public Ports Association.